Answer: All those extra lights cause less difficulty for professional astronomers, who prefer to sequester themselves in observatories on high mountaintops, miles from large metropolitan areas. You won’t find any holiday lights hanging around observatories. 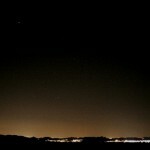 But they can still see the sky glow from nearby cities. For us amateur astronomers, it’s more of a problem. We generally observe from our own back yards, or sites not too far from home. Near Phoenix, we have to drive at least an hour to get to reasonably dark skies. It’s bad enough that some people leave their outside “security” lights on all night. Adding all that extra holiday wattage makes the stargazing even worse. Especially when the decorative lights are left on all night. The DOE has estimated that decorative lighting consumes three billion kilowatt-hours of electricity over the 30-day holiday period. At the national average utility rate of 8.4¢ per kilowatt-hour, that works out to $252 million. That’s a lot of money — and perhaps more importantly, a huge amount of energy. Take a look at the image below. Click on it to enlarge. This is a composite photo produced by NASA showing the extent of artificial illumination at night over the entire planet. And note that, if you can see the light from space, then the light must be traveling upwards. Very few lights need to shine upward … airport runway and monument lighting are two exceptions. So most of the light visible in this image is from improperly shielded fixtures. It’s just being wasted. Not all that upward-directed light gets to space. If it did, it would be less an issue for astronomers (though still a waste of energy). Some of it gets scattered by the atmosphere on the way out, creating what we call a light dome over large cities. It’s worse when there’s clouds to help scatter and reflect the light, but even on a “clear” night, dust, smog, and water vapor in the air conspire to create this effect. 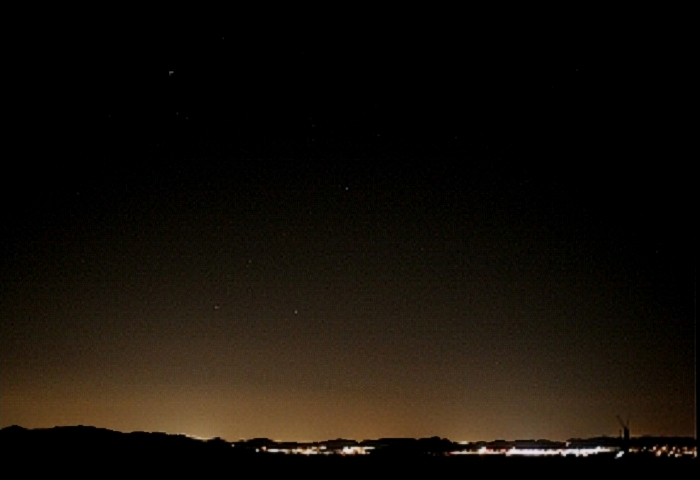 The image below shows the light dome over Phoenix, as seen from 40 miles north of city center. Click on it to enlarge. Note the few stars visible inside the dome. Don’t get me wrong. I’m not suggesting, Scrooge-like, that we do away with holiday lighting. Rather, consider switching from the older large C-7 bulbs to the newer mini-lights or, better yet, the newest LED lights. 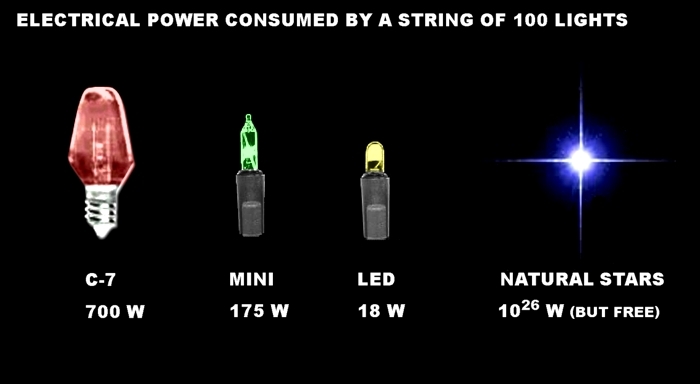 The LEDs use only 1/10 the energy of mini-lights, and 1/40 that of C-7s! And try not to get caught up in that “my house has more lights than yours” trap. Simple designs can be beautiful. Most importantly, as with all outside lights, turn them off before you go to bed, or when you’re done using your yard. And after New Years, put those decorations away till next season. Great artical Uncle Dan! 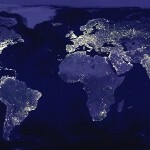 Really interesting picture of Earth and the light pollution of the different continents too! Terrific article Dan – words to live by!